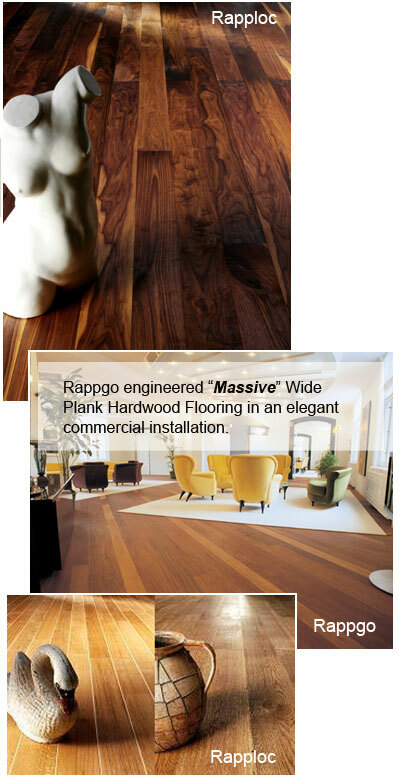 Castle Plank introduces Engineered and Solid Wood Flooring of "MASSIVE" wide widths and long lengths from 6" to 16" wide and 6' to 12' Lengths. Massive to say the least! This flooring is produced from a large variety of hardwood species, including antique heart pine. Additionally, we supply "RappLoc™" an innovative "CLICK-JOINTED" floating floor system. - Superior quality "Massive" wide planks from 6" to 16" widths and 6' to 12' lengths. - "Laser-Straight" precision milled flooring for easy installation. - Dimensionally stable multi-ply system incorporating form-stabilizing cross-ply core. - Excellent over "Under-Floor Heating Systems" and direct to concrete substrates. - Available in Oak, Ash, White ash, Maple, Walnut, Beech, Birch, Pine, Larch and Spruce. - Pine and Spruce can receive lye-treated only, or lye-treated and oil finishing. - Controlled factory finish in Oil, or formaldehyde-free UV. - Uniquely designed "Click-Jointed" on both sides and ends for ease of installation. - Floating floor eliminating the need to glue or nail. ALL PRODUCTS AVAILABLE "FSC CERTIFIED"
INQUIRE ABOUT OUR NEW "NORDIC LINE" OF HARDWOOD FLOORING PRODUCTS. ALSO CHECK WITH US OCCASIONALLY FOR SPECIAL INVENTORY DISCOUNTS. Copyright © 2019 Castle Plank. All Rights Reserved.